On Tuesday March 19, Mountain View City Council supported moving forward with the project to close Castro Street at the Caltrain tracks, extending Evelyn with an onramp onto Shoreline for drivers (and people bicycling), and building tunnels for people walking and bicycling under the tracks and under Central Expressway. With several options for the tunnel exit/entrance near the historic Adobe Building, City Council chose the narrowest pedestrian/bicycle ramp in order to maintain all of the vehicle parking for the building which is used for public events. Council was supportive of easing the process to get neighborhood parking permits, to help residents on streets that are used by visitors for event parking (this was discussed further at a later discussion that night about downtown area parking.) Council members were also interested in considering elevators for people with mobility needs who would find the long ramps challenging. Some community and Council members were interested in potentially improving the public space in the station area; and potentiallyÂ pedestrianizing the first blocks of Castro. These optionsÂ something that can continue to be worked on in future phases of the project, according to Mountain View staff and consultants. The first phase of the transit center project will be closing Castro Street to cars, leaving the crossing open in the meanwhile for people walking and bicycling before the tunnel is completed. Because the project is now moving forward, however, some Council members wanted to pull the plug on a project in progress to implement pedestrian safety improvements for the gnarly intersection where Central Expressway is crossed by Castro and Moffett. A proposed alternative is toÂ remove west side pedestrian crosswalk, assuming that pedestrians will then cross the complex intersection three times at lights.Â Community member video shows that crossing in a single leg of the intersection can take up to five minutes. 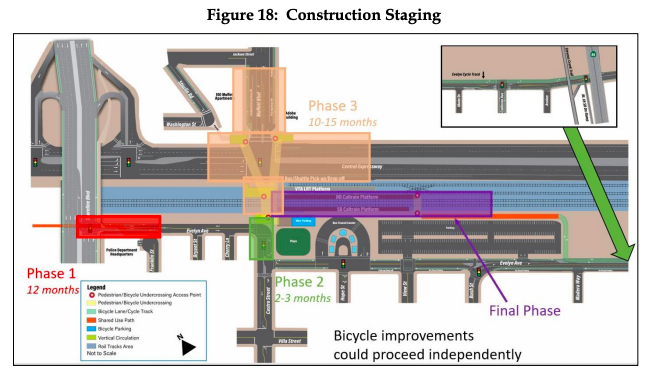 However, completion of the pedestrian/bike tunnels might take 3-5 years in a scenario where things go well (see schedule illustration below).Â Delays on large projects such as the transit center reconfiguration and bike/pedestrian tunnels are not uncommon. Looking only at financial risks and not considering a strategy focused on safety and “vision zero,” a strategy to eliminate serious traffic injuries and deaths. 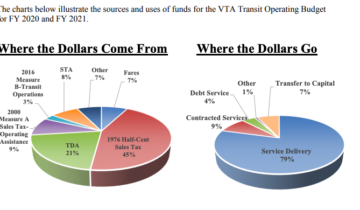 Links toÂ several news articlesÂ show $6M to $12M in liability costs for deaths and severe injuries of pedestrians attempting to cross El Camino Real, a comparable multi-lane arterial in the region with high-speed car traffic. In the interest of protecting life and health, and also financial prudence, the Castro/Moffett Central safety improvements seems good project to move forward and not stop, even though the surface crossing will be replaced in the foreseeable future. The only reason to hold off on the tunnel is to ensure it’s built to allow for 4 Caltrain tracks in the future – preferably in a way to allow two island platforms that can access all tracks. At the very least, rebuild the station for level boarding. Shockingly short-sighted and sad that bicyclists and pedestrians will be made to suffer the narrowest-possible (most cramped, least-inviting/comfortable) bike/ped tunnel in service of preserving a handful of off-street parking spaces (which might be used a few hours per day â€” at most!) at the Old Adobe building. What terrible priorities. Spend kajillions of dollars and then build a craptastically cramped facility to “save” a few parking spaces. Parking Ã¼ber alles? Wake up Mtn. View City Council and do the right thing here! @Martin: there’s no need to “hold off” as long as the tunnel is not built in a way so as not to preclude a possible additional set of tracks in the distance future. And no station can be “rebuilt for level boarding” until Caltrain has itself decided on precisely how (platform specifications and transition process) and when it will transition to level boarding. Of course, this will require 100% EMU operation … which there is no certain schedule for yet. First funding must be secured to pay Stadler to build & deliver sufficient additional EMUs. Adrian’s comment about the narrowest underpass is spot on. The city should focus on making the tunnel attractive so it’s perceived as a safe place; the narrowest option is unlikely to result in that. The place where Council approved the narrowest option wasn’t the tunnel itself, it was the ramps that enter/exit the tunnel next to the Adobe Building which is used for public events. Less narrow options would have removed some or all of the surface car parking at the venue.